Learn to meet the challenges of night photography with a private three hour Berlin Night Photo Tour. A three hour private photo tour in Berlin. Starting with coffee to review your photography skills and customise our tour to suit your level and go over technical skills. Shooting a variety of locations. 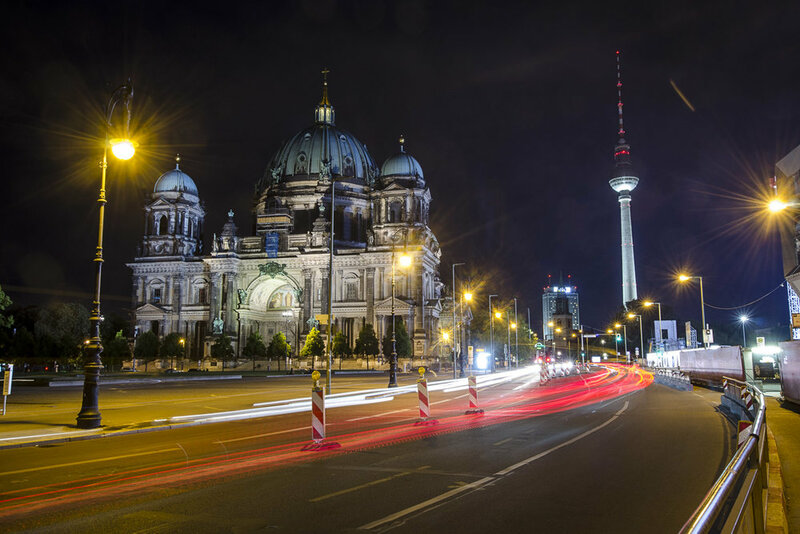 Catch the city that never sleeps in the darker hours and see Berlin come alive. From monuments to streetscape, the Berlin Night Photo tour will hone your skills. The Berlin Photo Night Tour leads you on a personalized trip under the lamps and past the cool waters of the Spree on this night-time exploration of the divided city. The three hour, private tour teaches you how to make beautiful night time images through mastering the more challenging elements of photography. Whether you are starting off, a hobbyist or have years of experience, our team of professional photographers will find superb photographic opportunities for all kinds of interests. Capture not just the grand landmarks, but the stream of car lights and the blurred passing of boats on the river Spree. Take advantage of the one-on-one experience of our private and personalized tour to develop your own creative vision while offering practical tips on photographing in low light and long exposures.